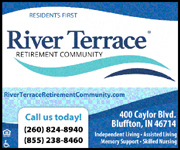 Jerry G. Baker, 83, of Huntington, IN, died Tuesday, Oct. 16, 2018, at 1:20 p.m. at Markle Health & Rehabilitation. Mr. Baker was a 1954 graduate of Huntington High School. He was the owner and operator of Baker & Sons Construction for 36 years. 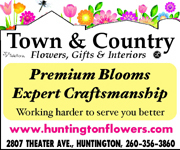 He was a member of St. Peter’s First Community Church, where he served as a deacon and elder, Huntington Kiwanis, LaFontaine Board and Carpenters Union Local 232 of Fort Wayne. He was born Jan. 7, 1935, in Huntington County to Floyd and Lelilam Landis Baker. He married Carol Mullarky on June 6, 1954. His wife survives. Additional survivors include three sons, Richard (Barbara) Baker, Scott (Robin) Baker and Kirk (Sherry) Baker, all of Huntington; seven grandchildren; and 11 great grandchildren. Calling is Saturday, Oct. 20, 2018, from 3 p.m. to 7 p.m. at the Myers Funeral Home Huntington Chapel, 2901 Guilford St., Huntington. A funeral service will be held on Sunday, Oct. 21, 2018, at 2 p.m. at the funeral home, with one hour of visitation prior to the service. Interment will be at the Pilgrims Rest Cemetery in Huntington County. 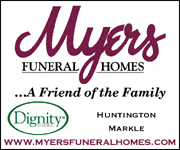 Memorial donations may be made out to Lewy Body Dementia Association, in care of Myers Funeral Home, 2901 Guilford St., Huntington, IN 46750. 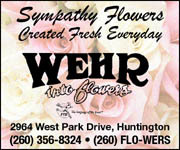 Online condolences may be made at www.myersfuneralhomes.com.